LLBLGen Pro designer embeds a full template editor which can also be used to edit textual files. To edit a template, open the Template Bindings Viewer and select the template files to edit as described in the Template Bindings Viewer editor documentation, or drag & drop a template file or text file on the LLBLGen Pro designer to open it in its editor. To have the designer open the file dragged/dropped onto it, it has to be started by the same user as the windows explorer, otherwise Windows will not allow it. Example, if the designer runs as administrator and Windows explorer as the normal user, dragging/dropping files onto the designer won't work. Which text file formats are recognized and which elements are available through the text editor are described below. In the stand-alone designer, to undo text in the text editor, use Ctrl-Z, as Ctrl-Shift-Z is for global undo on the model. Local re-do is defined as Ctrl-Y. See also Undo / Redo of Changes. To save a file, press Ctrl-Shift-S. Pressing Ctrl-S saves the project, not the file you are editing. The Text Editor's editing component accepts all key-strokes, which means that if you have a text editor tab as the active tab and you want to activate a menu option through a key-stroke, e.g. code generation through F7 or deleting an element from the project explorer by pressing DEL, it won't work, as the key is accepted by the active tab and handled there, as in a multi-doc environment, the active tab always has the focus as 'active'. In these situations, use the mouse or tab away from the text editor tab. When a file is an XML based file, and it contains a namespace declaration, the XSD is looked up in the set of XSD files shipped with LLBLGen Pro or in the list of XSD files shipped with VS.NET, in the folder specified in the designer preferences. This XSD will help the Text Editor to provide basic intellisense. 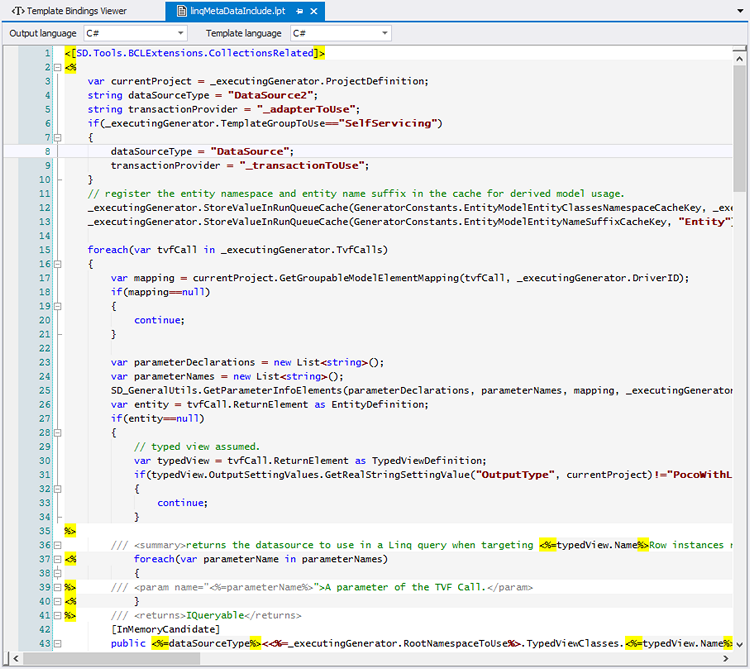 When the file is a C# or VB.NET code file and not a template, intellisense is also provided. When a logic language is selected for a C# / VB.NET template file, intellisense isn't provided due to a limitation in the editor component used. At the top of the Text Editor there are two language selectors: the Output Language selector and the optional Logic Language selector. These selectors are used to set the background parser for the text and, if applicable, the intellisense. Intellisense is provided when the Output language is either XML, C# or VB.NET and the Logic language is disabled. Logic language is enabled for .lpt and .template template files. In these template files, the Logic language is the language the template logic statements are written in, the code between the <% %> markers in .lpt templates and the code between <[ ]> markers in .template templates. There's basic find/replace implemented for a text editor (local file only, not cross- files open in the editor), which allows multi-line search/replace. Open it by pressing Ctrl-F.
To go to a specific line, press cntrl-G to bring up a small dialog to specify the line number you want to go to in the editor. There's basic refactor support for templates, i.e. .template files (TDL templates) and .lpt files (lpt templates). Refactorings are selectable through the Edit -> Refactor main menu.